Mason Family Eye Care offers comprehensive eye care services and in-demand lenses and frames to Mason and the surrounding communities. Click or call to connect, and access the quality of vision care you deserve. Mason Family Eye Care was formed in 1976 by Dr. Glen A. Linsley following his graduation from the Ohio State University’s College of Optometry. 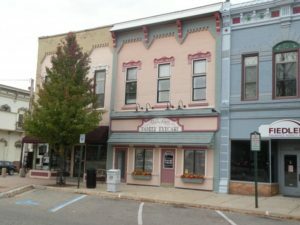 Having been raised on a farm on the outskirts of Charlotte, Michigan, Dr. Glen’s upbringing made him a suitable candidate to serve the beautifully quaint city of Mason. In 1979, Dr. Linsley’s brother Ed joined the team as an optician, beginning what would be a lifelong partnership. The Linsley brothers would prescribe and dispense numerous spectacles and contact lenses as a team that still continues to this day. In 2010, Dr. Glen’s eldest son Chad graduated from Ferris State University, becoming the practice’s second optometrist. In April 2011, both doctors celebrated their first year of practice together by traveling to Kenya to prescribe and dispense spectacles and ocular pharmaceuticals for 380 Kenyans in four days. The practice, less than five minutes off US 127 South, provides both vision and medical care. Mason Family Eye Care can meet visual needs including spectacles and contact lenses, pediatric and geriatric care, low vision and ocular disease management, and after-hour care for ocular emergencies. Mason Family Eye Care’s vision is to enhance yours in a way that is personal, professional, and trustworthy.